In the week of Remembrance, The Queen, and Members of the Royal Family, join the nation in commemorating and honouring the men and women who have sacrificed themselves in Service to our country. On the second Sunday of each November, The Queen and Members of the Royal Family remember those who have died in world wars and other conflicts. 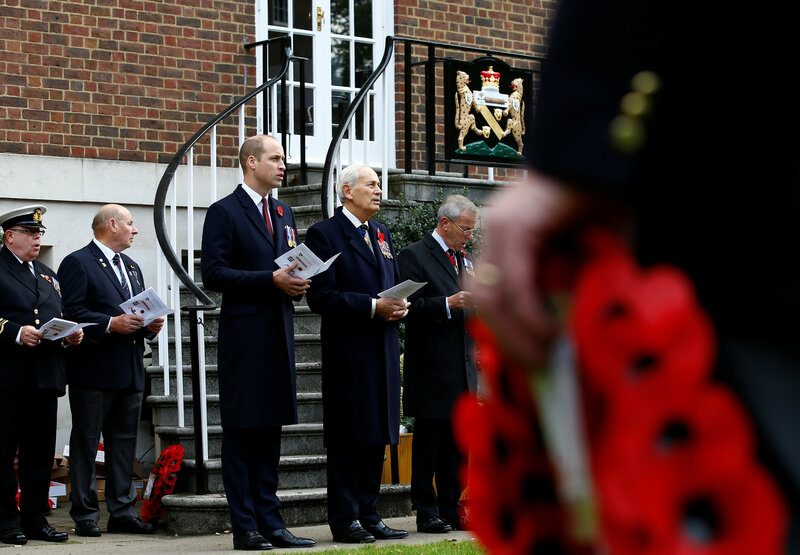 In a ceremony at the Cenotaph, the focal point of the nation's homage, Members of the Royal Family unite with others in thousands of similar ceremonies across the UK and worldwide in holding two minutes' of silence at 11am. In the run up to Remembrance Day members of the Royal Family attend a series of engagements to honour the fallen. The Duke of Sussex will visit the Field of Remembrance at Westminster Abbey on Thursday 8th November 2018. The Queen and Members of The Royal Family will attend the annual Royal Festival of Remembrance at the Royal Albert Hall. The Festival will be attended by The Queen, The Prince of Wales and The Duchess of Cornwall, The Duke and Duchess of Cambridge, The Duke and Duchess of Sussex, The Duke of York, The Earl and Countess of Wessex, The Princess Royal and Vice Admiral Sir Tim Laurence, The Duke and Duchess of Gloucester, The Duke of Kent and Prince and Princess Michael of Kent. The Queen and Members of the Royal Family will attend the annual Remembrance Day Service at The Cenotaph on Remembrance Sunday. The Queen will view the Service from the balcony of the Foreign & Commonwealth Office building. A wreath will be laid on The Queen’s behalf by The Prince of Wales. An Equerry will lay a wreath on behalf of The Duke of Edinburgh. The Service at the Cenotaph will also be attended by The Prince of Wales and The Duchess of Cornwall, The Duke and Duchess of Cambridge, The Duke and Duchess of Sussex, The Duke of York, The Earl and Countess of Wessex, The Princess Royal, The Duke of Kent and Prince Michael of Kent. Following the Service The Princess Royal will take the Salute at the March Past of Veteran Organisations on Horse Guards Parade. 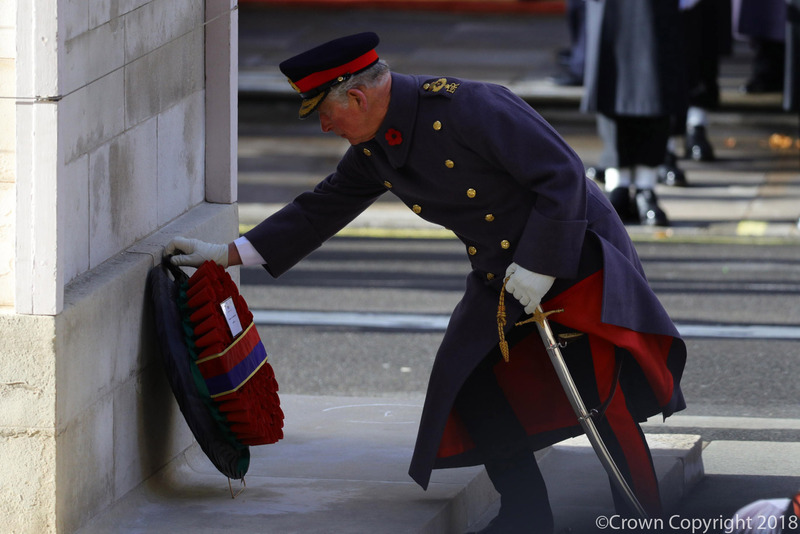 The Prince of Wales, Colonel of the Welsh Guards, will attend a Service at the Guard’s Chapel and lay a wreath at the Guards’ Memorial for the Welsh Guards’ Regimental Remembrance Sunday. The Duke of York will go on to a Commemorative Service marking the Centenary of the Armistice of the First World War at St Anne’s Cathedral, Belfast. The Earl and Countess of Wessex will attend the Welsh National Service of Thanksgiving at Llandaff Cathedral, Cardiff. The Princess Royal will attend the Scottish Commemorative Service for the Centenary of the First Armistice in Glasgow Cathedral. The Duke and Duchess Gloucester will attend The National Memorial Arboretum Armistice Day service in Staffordshire. That evening, Her Majesty The Queen, The Prince of Wales and The Duchess of Cornwall, The Duke and Duchess of Cambridge, The Duke and Duchess of Sussex, The Duke and Duchess of Gloucester, The Duke of Kent and Prince Michael of Kent will attend a Service to mark the Centenary of the Armistice at Westminster Abbey. Armistice Day 2018 marks 100 years since the Armistice was signed, end the First World War and so Remembrance 2018 is a particularly important and poignant year, with a number of extra commemorative events. Find out about Armistice 100 events near you. This evening The Queen, accompanied by Members of The Royal Family, attended a Service to mark the Centenary of the Armistice. 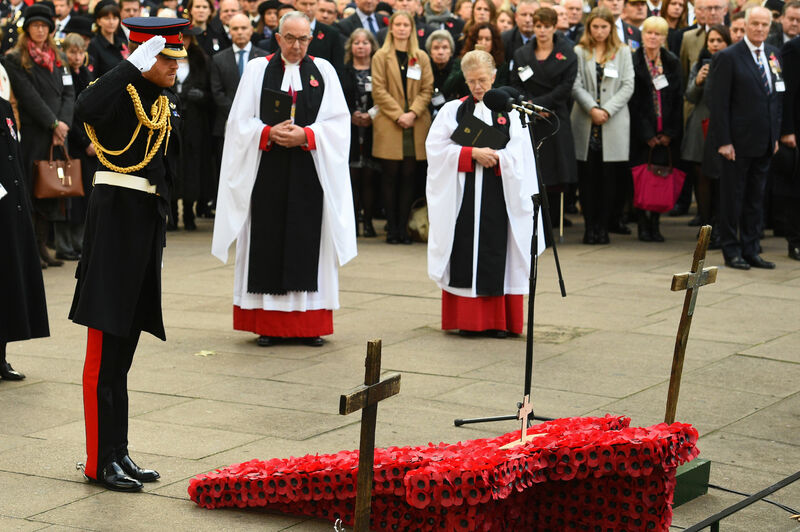 The Queen laid flowers on the Grave of the Unknown Warrior during the service – which commemorated the end of the First World War, 100 years ago. The service was also attended by The Prince of Wales and The Duchess of Cornwall, The Duke and Duchess of Cambridge, The Duke and Duchess of Sussex, The Duke and Duchess of Gloucester, The Duke of Kent and Prince Michael of Kent. The Prince of Wales gave a reading from the Bible during the service. The service was led by The Very Reverend Dr John Hall, Dean of Westminster and the Address was given by The Archbishop of Canterbury. There were performances from The Band of the RAF Regiment and a world premiere of a new anthem by Judith Weir sung by the Choir of Westminster Abbey and directed by James O’Donnell, Organist and Master of the Choristers. Fresh flowers replaced the scarlet poppies, which usually line the Grave of the Unknown Warrior – and children from across the UK, who have taken part in #Armistice100 projects, placed flowers at the Grave of the Unknown Warrior during the service. The Grave of the Unknown Warrior holds an unidentified British soldier killed on a European battlefield during the First World War – whose body was brought from France to be buried at Westminster Abbey on 11 November 1920. This evening, marks the finale of a day of national events to commemorate Armistice Day. On the 'eleventh hour of the eleventh day of the eleventh month' in 1918 the Armistice was signed, ending the First World War. 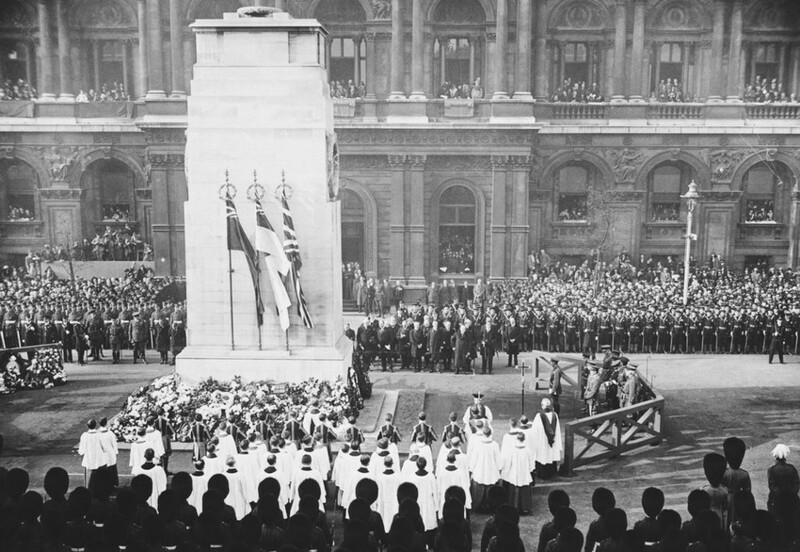 100 years on, The Queen and The Royal Family joined the nation in Remembrance, starting with the Service at the Cenotaph. Following a two-minute silence, the Service started. 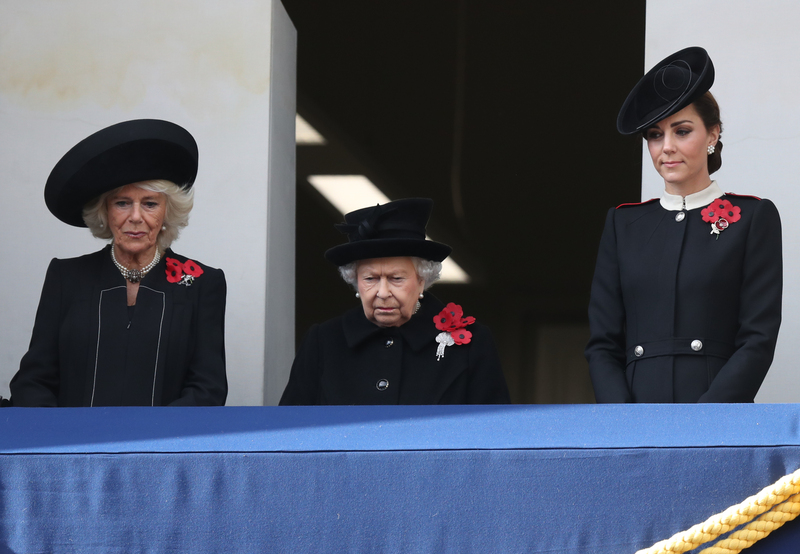 This year, The Queen joined by The Duchess of Cornwall and The Duchess of Cambridge, watched the event from the balcony of the Foreign and Commonwealth Office. 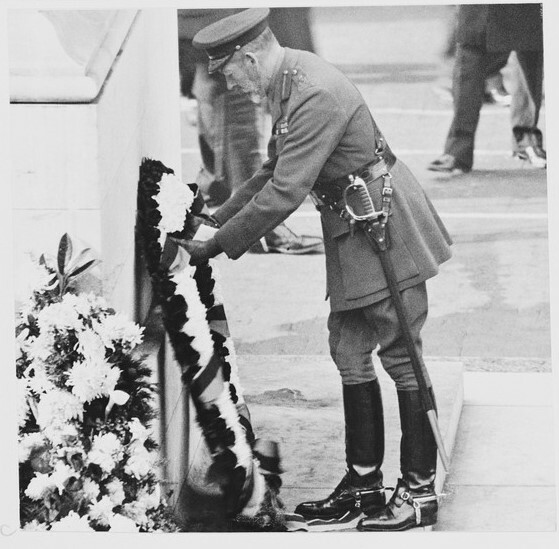 The Queen’s Wreath was a laid at the Cenotaph on her behalf by The Prince of Wales. The Cenotaph was designed by Sir Edwin Lutyens in 1919-20 as a National Memorial to those who died in the First World War, and is now the focal point for remembering those who fought and died in all conflicts. It was unveiled by King George V on 11 November 1920. Read extracts from his diary from that day. The Queen’s Wreath was followed by the President of Germany’s, Mr Frank-Walter Steinmeier, who joined the commemorations in London in this special #Armistice100 year. 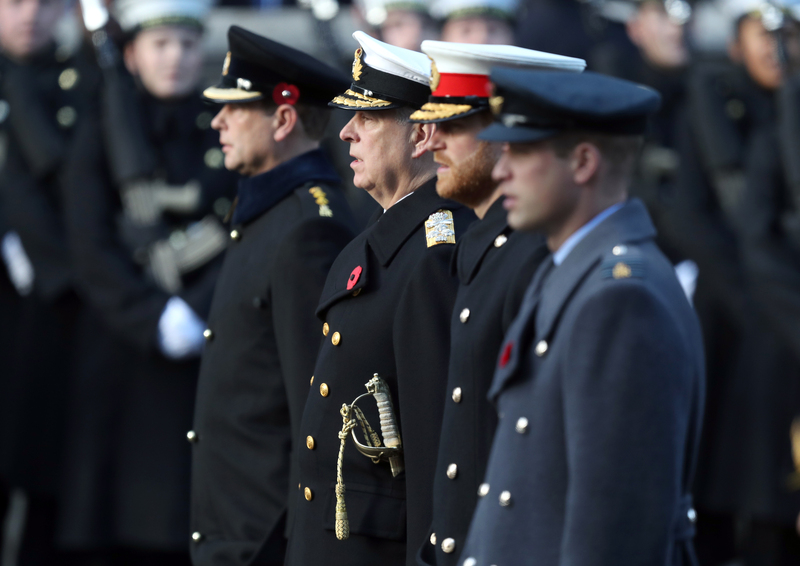 The Duke of Cambridge, The Duke of Sussex, The Duke of York, The Earl of Wessex, The Princess Royal, The Duke of Kent and Prince Michael of Kent all laid Wreaths at the Cenotaph. The Duke of Edinburgh’s was laid by his Equerry - a Captain in the Grenadier Guards. 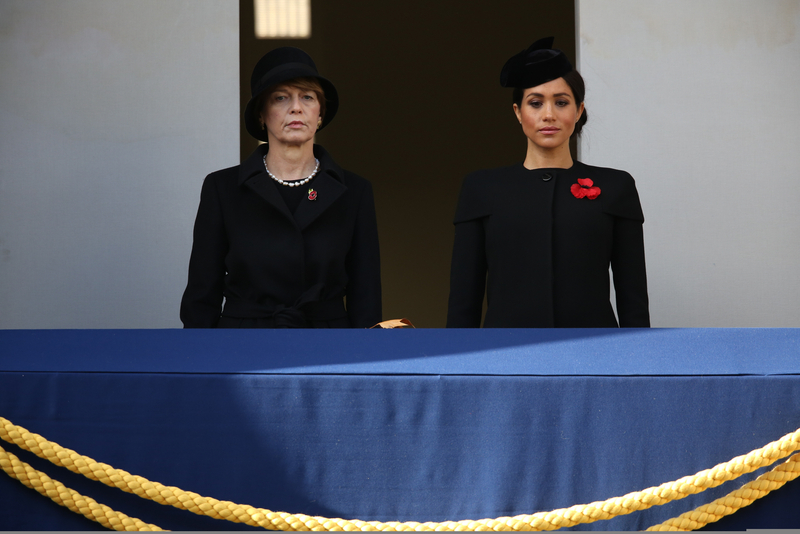 Frau Elke Büdenbender, The Duchess of Cambridge, The Duchess of Sussex, Vice Admiral Sir Tim Laurence and The Countess of Wessex all viewed the Service from the Foreign and Commonwealth Office Balcony. 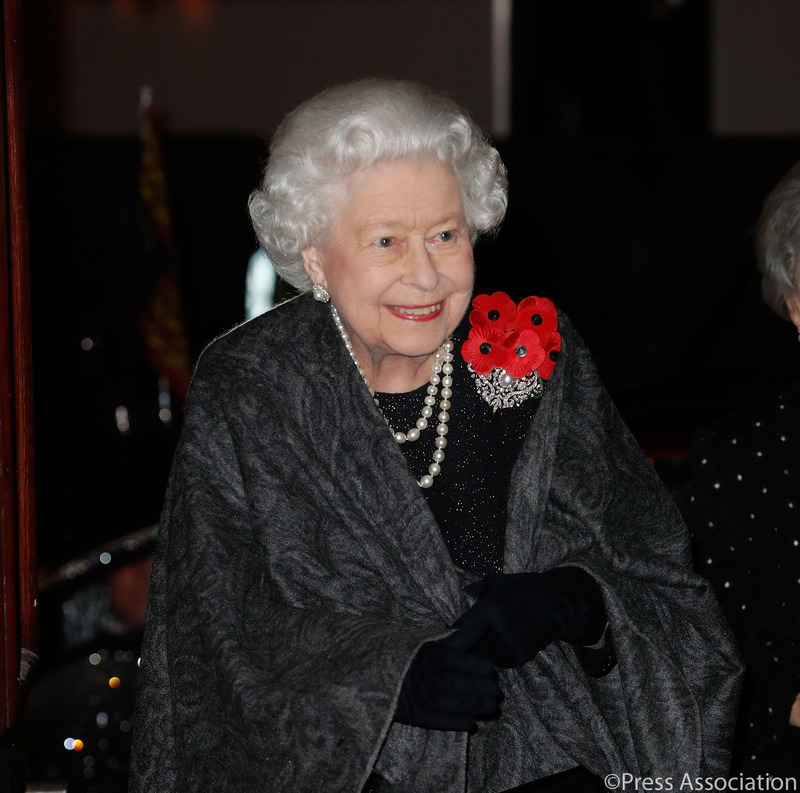 The Queen, accompanied by other members of the Royal Family, attended the annual Royal British Legion Festival of Remembrance at the Royal Albert Hall. This year’s Festival commemorated all those who have lost their lives in conflicts and marked 100 years since the First World War ended. 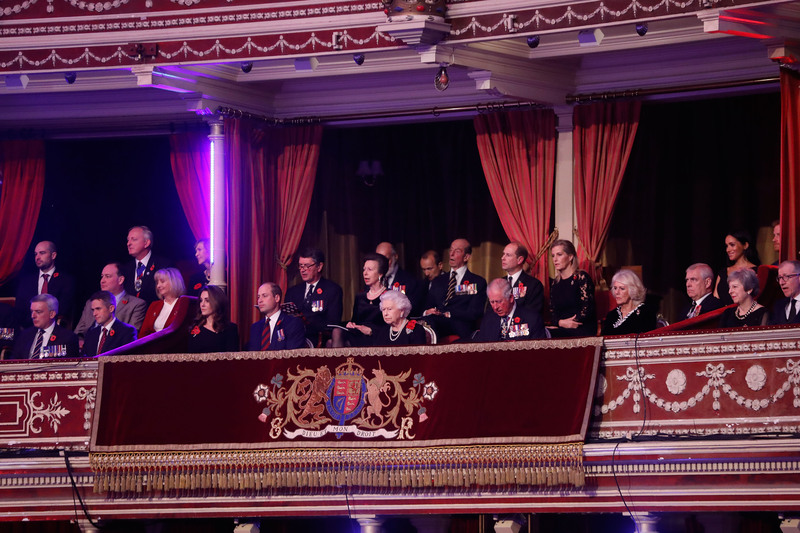 Joining The Queen this evening was The Prince of Wales, The Duchess of Cornwall, The Duke and Duchess of Cambridge, The Duke and Duchess of Sussex, The Duke of York, The Earl and Countess of Wessex, The Princess Royal, Vice Admiral Sir Tim Laurence, The Duke and Duchess of Gloucester, The Duke of Kent and Prince Michael of Kent. The Festival is an opportunity for the nation to say Thank You to all who served, and to those who sacrificed their lives. The performers included, Sir Tom Jones, Sheridan Smith, Sir Bryn Terfel, Tom Fletcher and Danny Jones, Sheku Kanneh-Mason and the Kingdom Choir will perform alongside the Central Band of the Royal Air Force and the Band of HM Royal Marines. A video message from The Duke of Cambridge was also played. His Royal Highness attended the official handover of the DNRC in June. 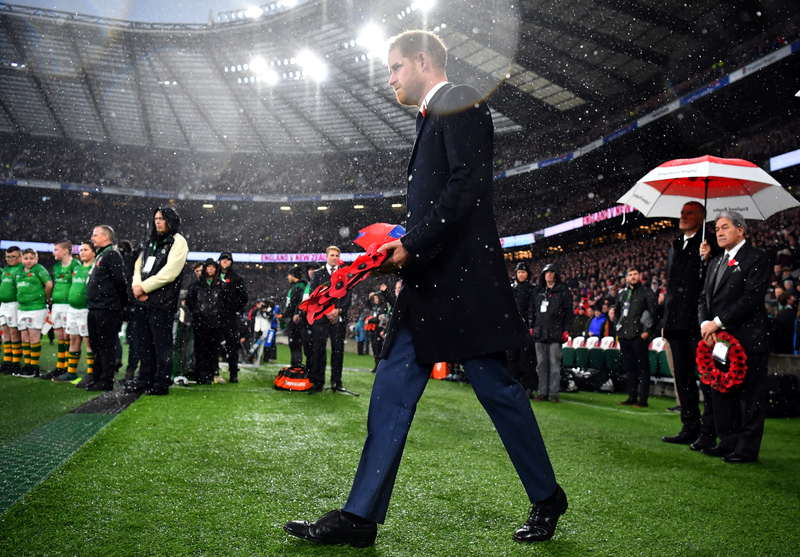 On Saturday 10 November, The Duke of Sussex, Patron of England Rugby, attended the England vs. New Zealand match at Twickenham Stadium. 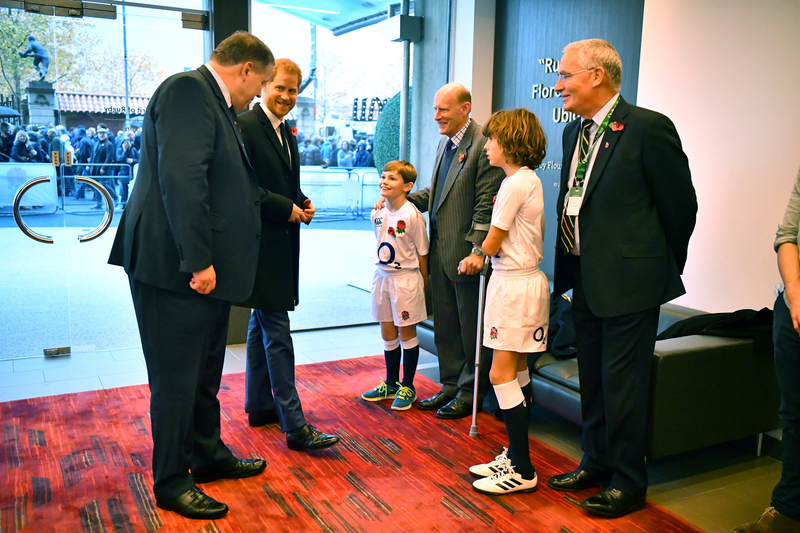 Before the match started, His Royal Highness met mascots Jack Davis and Max Garnett. Both are descendants of England captains who fought and lost their lives in the First World War. Jack’s great-great grandfather, Lancelot (Noel) Slocock, captained England in his last game against Scotland in 1908. He died on 9th August 1916 during the Battle of the Somme. 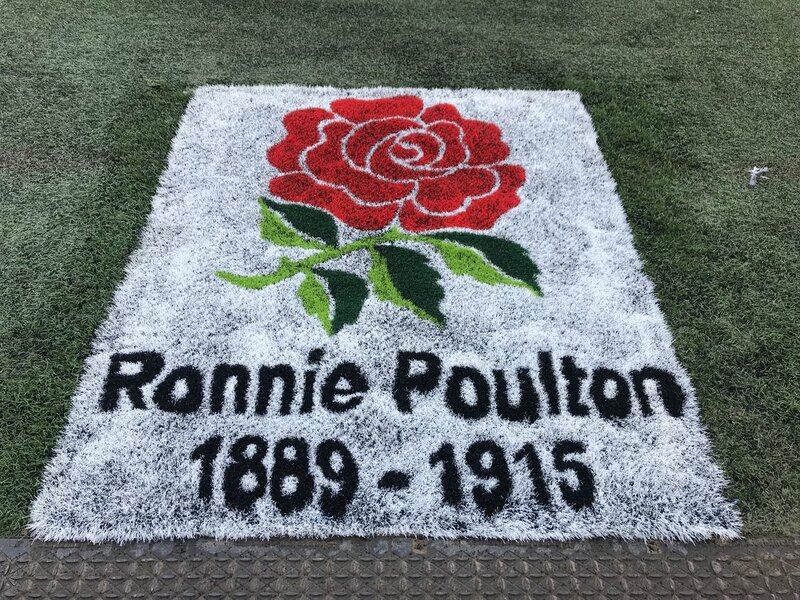 Max’s great-great uncle, Ronnie Poulton, was England captain from 1913-1914. Ronnie died in Belgium in May 1915. Soil from his war grave is buried next to the pitch at Twickenham. The Duke then laid a wreath on the pitch to commemorate those who have served and given their lives for their country. On Thursday 8 June, The Duke of Sussex visited the Field of Remembrance at Westminster Abbey, marking the 90th year of the event, and the 6th time that His Royal Highness has attended. The Field of Remembrance has been organised by The Poppy Factory and held in the grounds of Westminster Abbey since November 1928, when only two Remembrance Tribute Crosses were planted. 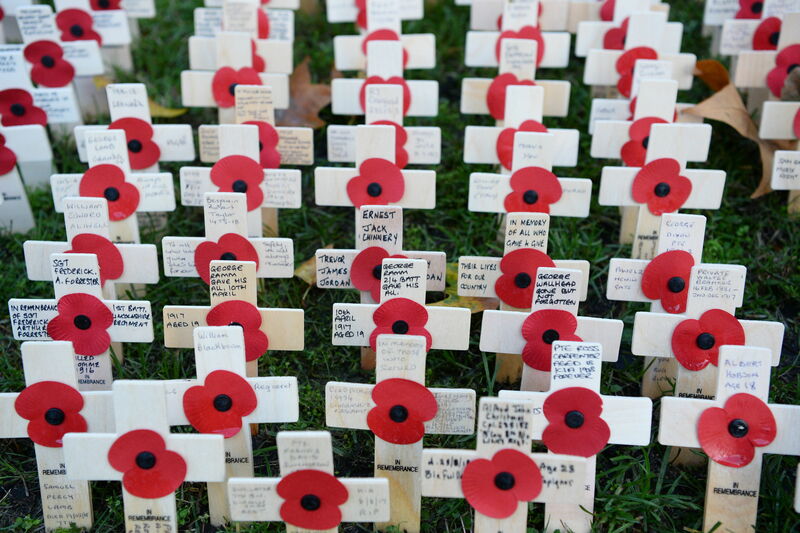 Each cross has been made by wounded, injured or sick veterans who have been employed by The Poppy Factory, a charity that has helped more than 1,000 veterans into work since 2010. Row upon row, with their scarlet poppies, around 70,000 crosses carry personal messages, from ex-servicemen and women, as well as members of the public, to those who lost their lives in service of our country. The crosses are planted on more than 360 plots for regimental and other associations. The Duke of Sussex planted his own Cross of Remembrance by two original crosses from the Graves on two Unknown Soldiers from World War One and World War Two , before visiting the plots and meeting veterans from all areas of the Armed Forces who have served in past campaigns and more recent conflicts. On Tuesday 6 November, The Countess of Wessex attended a Metropolitan Police Service at St Martins-in-the-Fields to commemorate the Centenary of the end of the First World War. Her Royal Highness gave a reading of John McCrae's famous war poem 'In Flanders Fields'. Major John McCrae was serving in the Canadian Field Artillery, when a young Lieutenant in his Regiment, Alexis Helmer was killed on 2 May 1915 during the second battle of Ypres. Major McCrae was the brigade doctor and conducted Alexis' funeral. It is believed that after the funeral he was inspired to draft his famous poem. The Service was commemorate the role of the Metropolitan Police's role in the First World War. 374 Police Officers and 20 Civilian Workers of the Metropolitan Police were killed in the War. 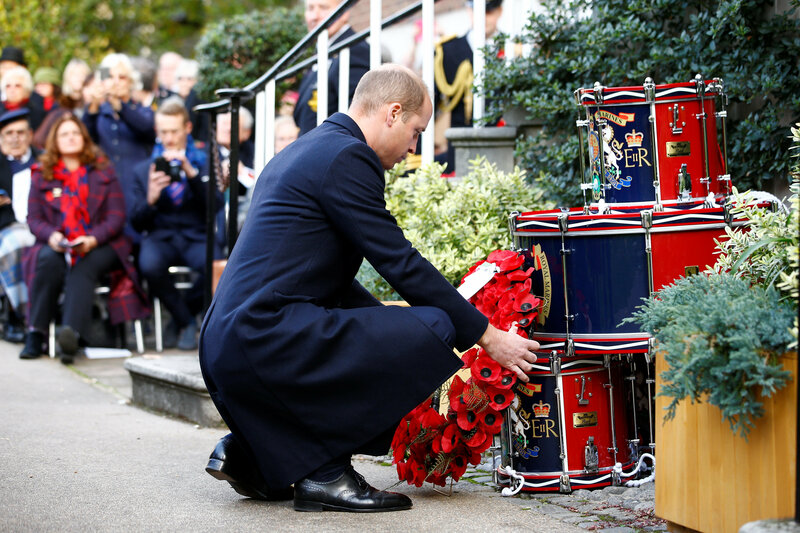 On Sunday 4 November, The Duke of Cambridge, Commodore-in-Chief of the Submarine Service, attended the Submariners' Remembrance Service and Parade at Middle Temple, London. The Service and Parade is held each year to honour Submariners of all generations who have 'Crossed the Bar' in Service to their country. Submarines played a significant role throughout the First Word War, including the defence of merchant shipping convoys. Approximately one-third of the Submarine Service’s personnel lost their lives during the War. On 31 October, The Duchess of Cambridge visited the Imperial War Museum to see family documents from the First World War. Three of Her Royal Highness's great-great-uncles, Lionel, Francis and Maurice Lupton, were killed in the War. Find out about their stories. The letters are part of Imperial War Museum’s Documents Archive, which provides a means to research, reflect and remember the extraordinary contribution and sacrifice made by so many families during the First World War. During the visit, The Duchess also viewed the ‘Weeping Window’ installation that is currently displayed at the Imperial War Museum. Comprised of several thousand ceramic poppies, the work was originally created as part of part of the ‘Blood Swept Lands and Seas of Red’ at the Tower of London in 2014, with each poppy representing a life lost in WWI. To commemorate 100 years since the end of the FIrst World, every day from 1 November to Remembrance Sunday we'll be sharing items from the Royal Archives that document how The Royal Family, and the Royal Household, played a part in the War.